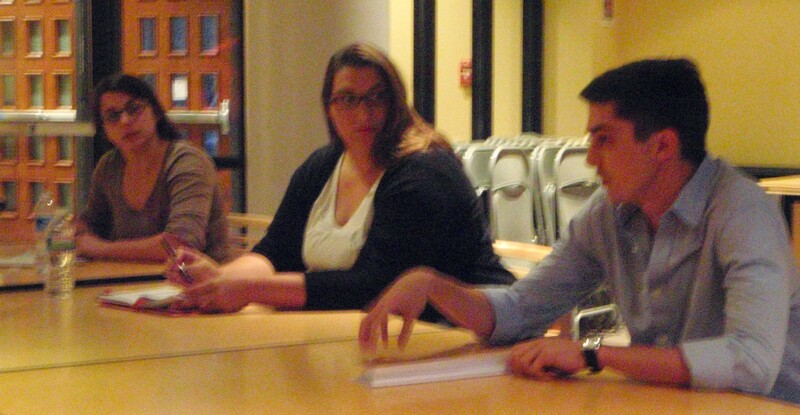 There were some excellent discussions last night during our Open Access Week faculty and graduate student panels. 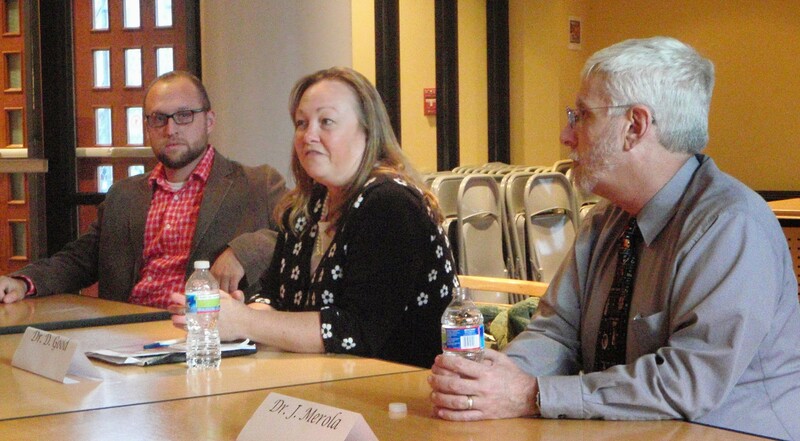 Our faculty panelists were Dr. Zachary Dresser (Religion and Culture), Dr. Deborah Good (Human Nutrition, Foods, and Exercise), and Dr. Joseph S. Merola (Chemistry). Both Dr. Good and Dr. Merola have had positive and negative experiences with open access journals. Dr. Good has had positive interactions with PLoS One as an author and peer reviewer, but criticized some hybrid open access journals for asking whether she wanted to take the open option before the paper had been peer reviewed, which could lead to a real or perceived bias due to the fee involved. She has also been asked to become editor of a journal on Beall’s list of predatory journals. Dr. Merola serves on the editorial board of an open access journal and has had good experiences with open access in general. But he has submitted to another open access journal that would not withdraw a paper or remove him from its editorial board. Dr. Merola also noted that hybrid journals are unlikely to reduce subscription prices with open access takeup. Both Dr. Merola and Dr. Good noted that abstracting and indexing can be a problem with open access journals. Dr. Dresser primarily writes in the field of history, and noted that humanities journals have shown little movement toward open access. The monograph is the gold standard in these fields, and he referred to the AHA controversy that was the subject of Monday’s ETD Panel. Dr. Good asked why ETDs (electronic theses and dissertations) could not be broken into separate articles as happens in the sciences. Dr. Dresser responded that though it happens on occasion, history is a very traditional field that places value on a story or narrative as a whole (thus the focus on monographs). Interestingly, Dr. Dresser is participating in an open textbook effort in American history. Our graduate student panelists were Stefanie Georgakis (Ph.D. candidate in Public and International Affairs), Jennifer Lawrence (Ph.D. candidate, ASPECT), and Joshua Nicholson (Ph.D. candidate in Biological Sciences). Stefanie and Jennifer are co-editors of the Public Knowledge Journal, an interdisciplinary open access journal for publishing work by graduate students (at any university). Josh Nicholson is co-founder of The Winnower, an open access journal in the sciences that will be starting in 2014. Stefanie and Jennifer are struggling with the sustainability of PKJ, though not in the way you might think. While the journal is hosted on campus, the challenge is finding editors, peer reviewers, and submissions from a constantly changing population. PKJ is seeking a formal partnership to ensure its sustainability. Stefanie and Jennifer are also hoping to increase readership and provide for the preservation of journal content. They felt that alternative perspectives are suited for open access, and enabling open discussion of articles on the journal site can combat the inward-looking culture of some traditional journals. PKJ can help graduate students become familiar with the publishing environment, a need also identified by Dr. Good earlier in the evening. Josh is critical of traditional publishing, and especially of peer review. The Winnower will serve the sciences as a low-cost ($100 article processing charge) open access journal that will also employ open peer review (he noted that the NIH’s PubMedCentral has just begun post-publication review). Articles under review could be revised as a result of review for the first 3 months, then assignment of a DOI would signify publication, though further reviews could be added. Attracting reviewers could be a problem, and he is open to using a centralized service such as PubPeer. Reviews would be structured, avoiding a problem Stefanie and others brought up of short, insubstantial reviews. Reviewers themselves would be rated (similar to Amazon), with top reviewers perhaps receiving credit toward article publication. While there has been some concern about the potential for racism or sexism in an open environment, the session attendees seemed to agree that transparency was the best option, particularly in fields with single-blind peer review where bias could occur but not be revealed. I asked whether The Winnower would try to become a member of OASPA (Open Access Scholarly Publishers Association), but Josh replied that the journal’s model would not fit their guidelines (such as having an editorial board) or PubMed’s listing criteria, echoing the abstracting and indexing concern mentioned by Dr. Good and Dr. Merola earlier. Thanks again to all of our panelists for a great discussion, and to the event organizers, Kiri Goldbeck DeBose and Purdom Lindblad. This entry was posted in Open Access Week, Open Peer Review, University Libraries at Virginia Tech and tagged Faculty, Perceptions, Videos. Bookmark the permalink.